For other uses, see Cosmos (disambiguation). The cosmos (UK: /ˈkɒzmɒs/, US: /-moʊs/) is the universe. Using the word cosmos rather than the word universe implies viewing the universe as a complex and orderly system or entity; the opposite of chaos. The cosmos, and our understanding of the reasons for its existence and significance, are studied in cosmology – a very broad discipline covering any scientific, religious, or philosophical contemplation of the cosmos and its nature, or reasons for existing. Religious and philosophical approaches may include in their concepts of the cosmos various spiritual entities or other matters deemed to exist outside our physical universe. The philosopher Pythagoras first used the term cosmos (Ancient Greek: κόσμος) for the order of the universe. The term became part of modern language in the 19th century when geographer–polymath Alexander von Humboldt resurrected the use of the word from the ancient Greek, assigned it to his five-volume treatise, Kosmos, which influenced modern and somewhat holistic perception of the universe as one interacting entity. Cosmology is the study of the cosmos, and in its broadest sense covers a variety of very different approaches: scientific, religious and philosophical. All cosmologies have in common an attempt to understand the implicit order within the whole of being. In this way, most religions and philosophical systems have a cosmology. When cosmology is used without a qualifier, it often signifies physical cosmology, unless the context makes clear that a different meaning is intended. Physical cosmology (often simply described as 'cosmology') is the scientific study of the universe, from the beginning of its physical existence. It includes speculative concepts such as a multiverse, when these are being discussed. In physical cosmology, the term cosmos is often used in a technical way, referring to a particular spacetime continuum within a (postulated) multiverse. Our particular cosmos, the observable universe, is generally capitalized as the Cosmos. In physical cosmology, the uncapitalized term cosmic signifies a subject with a relationship to the universe, such as 'cosmic time' (time since the Big Bang), 'cosmic rays' (high energy particles or radiation detected from space), and 'cosmic microwave background' (microwave radiation detectable from all directions in space). According to Charles Peter Mason in Sir William Smith Dictionary of Greek and Roman Biography and Mythology (1870, see book screenshot for full quote), Pythagoreans described the universe. Cosmology is a branch of metaphysics that deals with the nature of the universe, a theory or doctrine describing the natural order of the universe. The basic definition of Cosmology is the science of the origin and development of the universe. In modern astronomy the Big Bang theory is the dominant postulation. 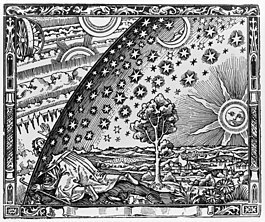 In theology, the cosmos is the created heavenly bodies (sun, moon, planets, and fixed stars). In Christian theology, the word is also used synonymously with aion to refer to "worldly life" or "this world" or "this age" as opposed to the afterlife or world to come. Aristotle says the poet Orpheus never existed; the Pythagoreans ascribe this Orphic poem to a certain Cercon (see Cercops). The Orphics were an ascetic sect; wine, to them, was only a symbol, as, later, in the Christian sacrament. The intoxication that they sought was that of "enthusiasm," of union with the god. They believed themselves, in this way, to acquire mystic knowledge not obtainable by ordinary means. This mystical element entered into Greek philosophy with Pythagoras, who was a reformer of Orphism as Orpheus was a reformer of the religion of Dionysus. From Pythagoras Orphic elements entered into the philosophy of Plato, and from Plato into most later philosophy that was in any degree religious. ^ "cosmos". Dictionary.com. Retrieved 2017-06-01. ^ Iamblichus, Pyth., β 59; Aetius ΙΙ 1.1. ^ Anaxagoras further introduced the concept of a Cosmic Mind (Nous) ordering all things (Aetius Ι 3.5). ^ Humboldt, Alexander von; Paul, Benjamin Horatio; von), Wilhelm Humboldt (Freiherr; Dallas, William Sweetland (1860). Cosmos: a sketch of a physical description of the universe. Harper & brothers. ^ "Introducing Humboldt's Cosmos | Center for Humans & Nature". Center for Humans & Nature. Retrieved 2017-06-01. ^ a b Sir William Smith (1870). Dictionary of Greek and Roman biography and mythology. Boston, Little. p. 305. ^ "Definition of "Cosmology"". www.merriam-webster.com. Retrieved 2017-06-01. ^ "Concerning Aion and Aionios". Saviour of All Fellowship. Retrieved 22 April 2014. ^ Bertrand Russell (1947). History of Western Philosophy. George Allen And Unwin Ltd London. Look up cosmos in Wiktionary, the free dictionary. Hawking, S.W. (2001). The Universe in a Nutshell. Bantam Book.